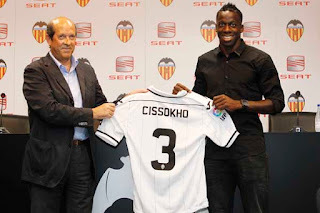 Aly Cissokho was officially presented today at 18:00 O'clock at the hall Antonio Puchades as a Valencia CF player where the team officials and Aly spoke and took pictures in the Valencia CF kit. The ceremony was chaired by Manuel Llorente, President of Valencia CF, and was attended by members of the Board Jose Garcia Roig, Fernando Giner, José Antonio García Moreno and Braulio Vázquez, Director Sports, Damià Vidagany, Director of Marketing, Communication and Image and Jordi Bruixola, Director of External Relations and Institutional. Valencia CF president said: "Valencia CF attracts players like Aly, who has given up part of his salary to come here. We are very happy with his arrival". Aly Cissokho took the stage and said: "this is a big step forward in my career, I come to a historic club and I have really wanted to come to this team" After posing with his new shirt and it disclosed that he will wear the number 3 shirt, the press conference started, in which the French player has explained the reasons that led to him giving up money and opting to come to Valencia CF:"football is a passion and not a business and therefore it was not hard to give up money. In France every player dreams to come and play for Valencia CF".